Evoke the classic beauty of antique linens with this week's new designs! Floral blooms, Sunbonnet Sue and Fisherman Fred stuffies, vintage-style Days of the Week teddy bears, and more are perfect for giving your home antique-inspired style. 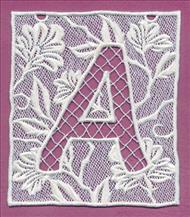 Plus, a lace bunting alphabet is an elegant way to decorate for parties, add a sweet style to home decor, or spruce up a holiday display. Scroll down the page to see these beautiful designs! charming look to any living space! Click here to see how it's made. 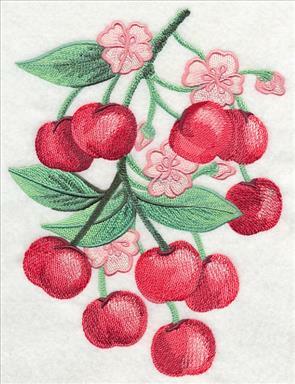 Bright, juicy cherries and gorgeous cherry blossoms are stitched to replicate the beautiful, traditional look of watercolor paintings. 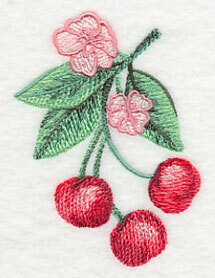 Varying colors in the leaves and cherries add a realistic style; lighter and darker shading adds texture and depth. 6.90" x 9.18" and 5.86" x 7.80"
6.89" x 11.72" and 5.53" x 9.40"
4.58" x 7.80" and 4.03" x 6.86"
These beautiful designs are perfect for updating a set of table linens, or adding an antique look to your bedding. 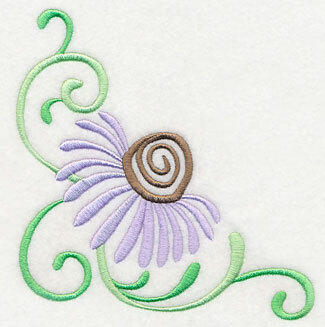 Stitch this border along the edge of a pillowcase, or add to the bottom of a placemat. 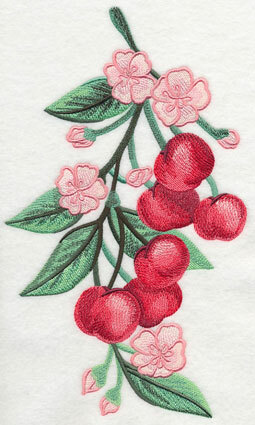 11.75" x 4.95" and 9.40" x 3.97" and 7.80" x 3.29" and 6.00" x 2.81"
Finish this set of cherries and blossoms with a coordinating corner and accent design. 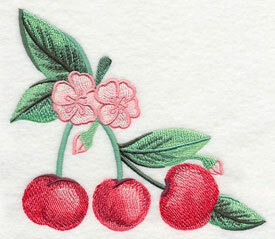 They're the perfect size for embroidering on the corner of a handkerchief, a napkin, or a tea towel. Bring the beauty of antique linens to your home with this watercolor design pack. 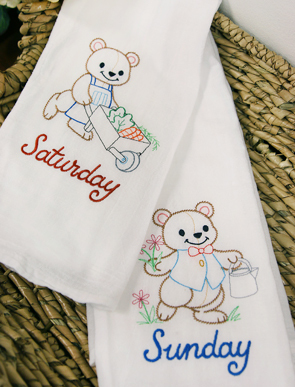 Tea towels get a sweet update thanks to the cheerful teddy bears in these Days of the Week designs. 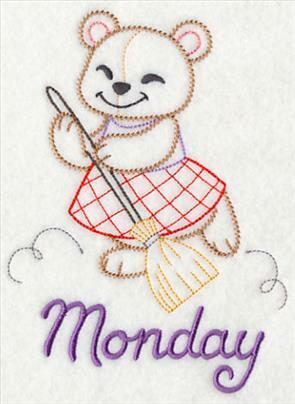 Each bear is engaging in a different household chore; here Sunday takes care of the garden while Monday sweeps the house. 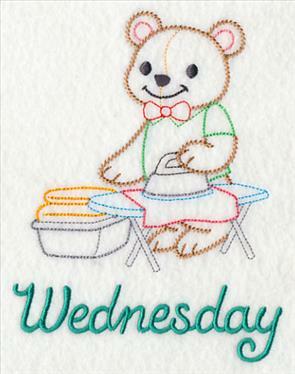 4.55" x 6.27" and 2.81" x 3.89"
The days of the week are stitched on the last color stop for these designs, so you can stitch the bears on their own. Pick your favorites for a quilt, or stitch as-is on a set of tea towels. 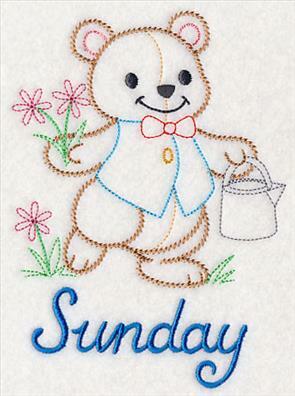 4.86" x 6.34" and 2.98" x 3.90"
These teddy bear designs have been digitized in the traditional vintage style, and are especially beautiful on light, low-nap fabrics such as quilter's cotton, linen, twill, and canvas. 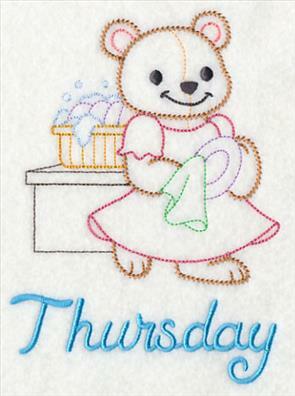 3.56" x 6.43" and 2.15" x 3.89"
Add these adorable Days of the Week teddy bears to your next project! They're a fabulous way to add antique flair to your home. 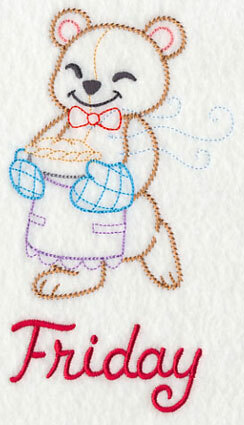 4.69" x 6.42" and 2.85" x 3.90"
Find our best tips for embroidering on floursack towels in this free tutorial. Purchase these colorful Teddy bear designs individually by clicking the links above, or get all 7 of the designs in a pack. Blossoming flowers add stunning antique style to bed and table linens, handkerchiefs, table scarves, and more. 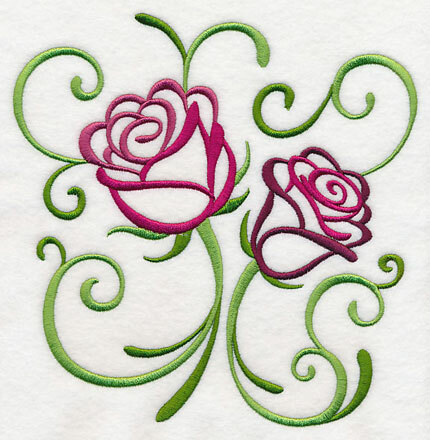 These gorgeous roses are stitched with multiple thread colors, adding an unexpected level of depth to the design. 7.62" x 7.82" and 6.92" x 7.09" and 5.87" x 6.02" and 4.84" x 4.97" and 3.77" x 3.87"
A beautiful border matches perfectly with the blooming roses above, and is perfect for stitching a coordinating set of table linens or bedding. 11.76" x 4.04" and 9.41" x 3.24" and 7.81" x 2.69" and 6.00" x 2.29" and 5.71" x 2.07"
Corner designs are surprisingly versatile and this stunning rose is no different. 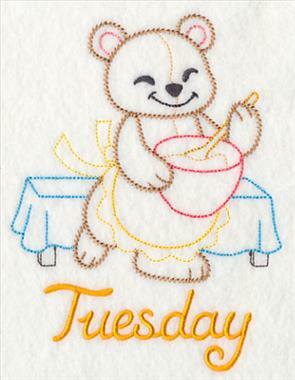 Repeat on a pillow to make your own pattern, or add to a pocket or napkin! 6.00" x 5.86" and 4.97" x 4.86" and 3.87" x 3.78"
Bright and colorful chrysanthemums shine in this flourishing design. Embrace the antique theme and stitch it on table scarves or pillowcases. 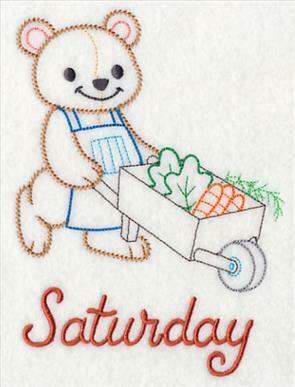 Or, stitch on framed art, pillows, and aprons! 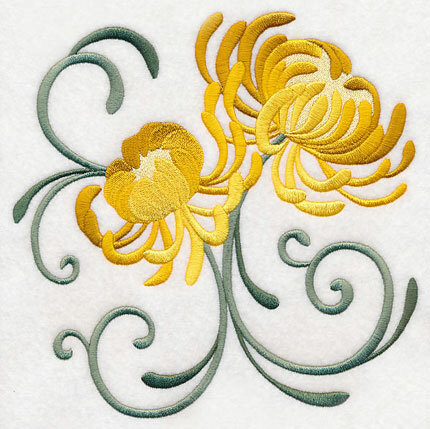 7.81" x 7.80" and 6.87" x 6.85" and 5.87" x 5.86" and 4.87" x 4.86" and 3.87" x 3.86"
This border design also features the brilliant mums and is delightful on any embroidery project. 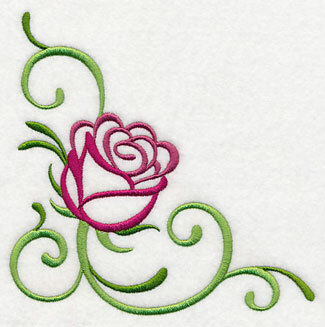 Embroider onto apparel for an instant update, or let them shine on towels, purses, and totes. 11.75" x 3.71" and 9.41" x 2.98" and 7.81" x 2.47" and 6.01" x 1.90" and 3.87" x 1.37"
Add this blooming mum to shirt pockets, quilt corners, or the edges of tablecloths. 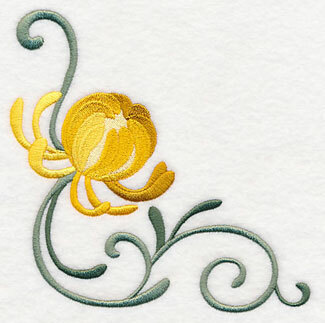 The pretty flower and flourishing details make an irresistible combination. 5.86" x 5.81" and 4.86" x 4.80" and 3.87" x 3.81"
Update a t-shirt, tote bag, or table runner with these lovely cone flower designs! 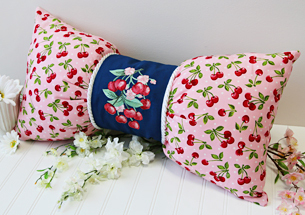 The bright colors and unique details make them perfect for pillows, quilts, wall hangings, and more. 7.81" x 7.80" and 6.86" x 6.85" and 5.87" x 5.86" and 4.87" x 4.86" and 3.87" x 3.86"
Create a matching set of bath and hand towels, table or bed linens, or shirt and pocket designs with these colorful cone flower designs! 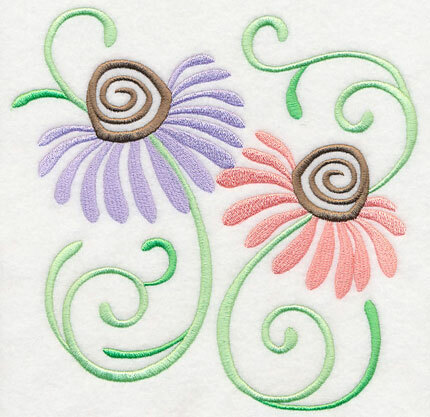 11.75" x 4.36" and 9.41" x 3.50" and 7.81" x 2.90" and 6.00" x 2.51" and 3.87" x 1.55"
Add a corner cone flower design to blankets and quilts, linen napkins, and pockets for a fabulous addition to your embroidery projects. 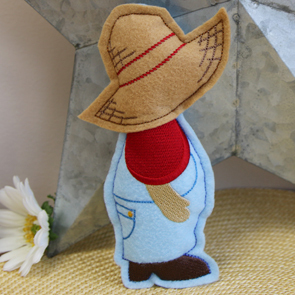 5.86" x 5.92" and 4.86" x 4.91" and 3.83" x 3.87"
Stuffed Sunbonnet Sue and Fisherman Fred designs are stitched entirely in the hoop, and are a fabulous way to show off your crafty interests! They're especially adorable displayed together hung from windows, light fixtures, or even on a Christmas tree come December! 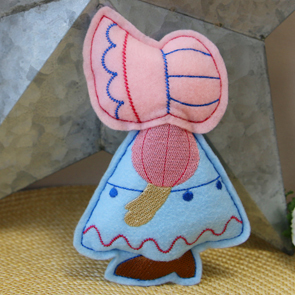 Get instructions for these in-the-hoop stuffies right here. 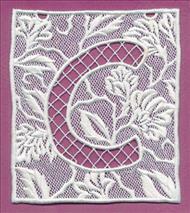 4.27" x 6.73" and 2.42" x 3.81"
Gorgeous lace letters make the perfect bunting for anniversaries, baby and bridal showers, kids' room decor, and more! Whip up letters spelling a name, congratulations, or "Welcome." 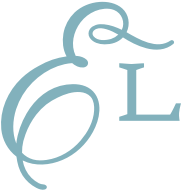 Designs featuring letters, numbers, and punctuation are all available in two different sizes. Find the project instructions for these letters here. 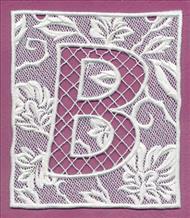 Purchase the whole bunting lace alphabet designs in a pack! They're beautiful decor items for parties, bedrooms, and more. 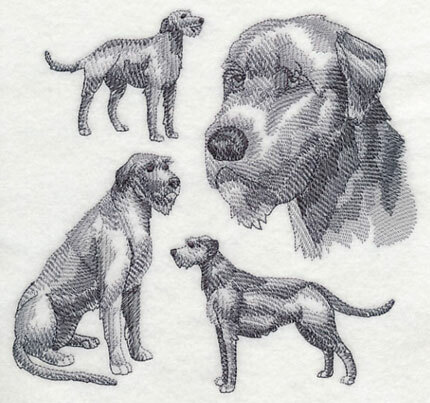 6 Inch Height -- Designs smaller than 5" x 7"
4 Inch Height -- Designs smaller than 4" x 4"
Shirley has a friend who simply adores Irish Wolfhounds, and was looking for a design to frame as a gift. Thanks for the suggestion, Shirley! 7.28" x 6.90" and 6.18" x 5.85" and 5.07" x 4.81"